How to build Inline Frame components – How can we help you today? Overview The Inline Frame component lets you display web content such as widgets, flash, videos, or web pages on your dashboard. Important: Use "https" to begin the URL when you are using a Google Chrome, Mozilla Firefox, or Safari web browser. These web browsers do not allow the use of non secure content (http) within a secure (https) environment. The Inline Frame component is ideal for displaying web content on your dashboard so that you can view relevant content, such as data coming from a widget in a single location. This component supports widgets, flash, videos, and website navigation. 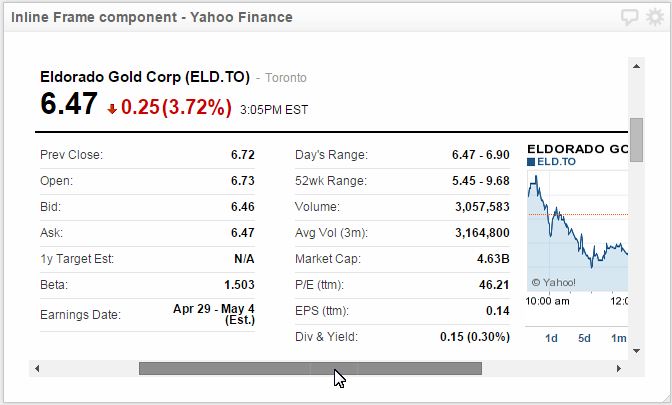 This is an example of the Inline Frame component displaying the stock market status of Eldorado Gold Corp from Yahoo Finance. Here is the structure of the Inline Frame component. This area of the Klip Editor is called the Component Tree. This section provides examples of the different ways to use the Inline Frame component. Drag an Inline Frame component into the Klip workspace. The Data panel automatically appears. Using the Insert Text or Number button, replace the existing text with your URL. On the Properties panel of the Klip Editor, you can adjust size and overflow options. Height Choose from Small to Very Large. Or, select Custom, and adjust the height in pixels to 400 px for example. Overflow Choose Auto Scrollbars if you want your Klip to show a scrollbar. 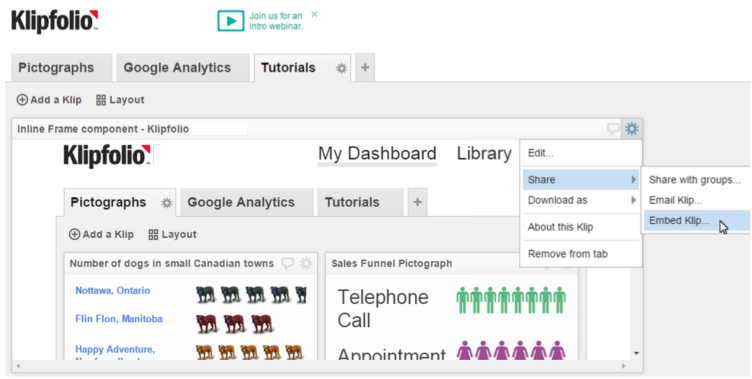 Some Klipfolio customers use the Inline Frame component to embed their dashboard on a website. To do this you can use the Klipfolio URL.